Lights, sounds and action on the playground! Pulse’s multi-sensory, interactive games encourage movement in an exciting new way. 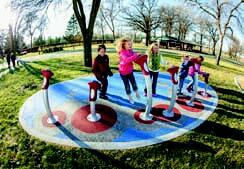 Whether creating a new playground or refreshing an existing one, bright and active Pulse equipment will have kids racing back for more fun. Learn more and see Pulse in action at playlsi.com/Pulse-Video.